Posted on Mon, Feb 13, 2012 : 10:30 a.m. In the cafeteria, we enjoyed some lovely gravlax as well as a sweet apple cake served in typical Swedish fashion with a light vanilla sauce. In the grocery section, we spun 'round to grab shrimp and anchovies and cheese, to ogle syrups and caviars and beverages, to buy chocolate and jam and cookies. I went home with a variety of items and plans to start cooking. I immediately took the whole-grain bread mix I'd bought and baked a fabulous dense, slightly sour loaf. 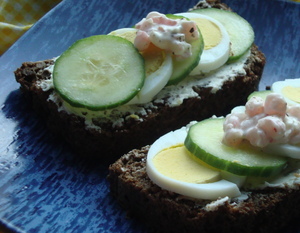 It was perfect served with a firm cheese, but I also wanted to try some beautiful Swedish-style sandwiches, as well. Sassa had shown such passion for the foods of her homeland, especially for the simplicity of the cuisine which showcases the purity and integrity of well-chosen ingredients. Whereas here we tend to "kick it up a notch," Swedes don't typically overwhelm with rich sauces and layering to mask the main items in a dish. So these sandwiches don't feature multiple layers of toast and cole slaw and french fries and pickles and secret sauce and whatnot. A slice of good bread, some butter flavored with the addition of dill, unadultered slices of egg and cucumber and a light garnish of a shrimp salad... that's all you need. The crispness of the cucumber contrasts with the softness of the egg. The sweetness of the shrimp (Scandinavian shrimp have a different flavor than ones from this side of the ocean) contrasts with the bite from the sprinkling of pepper. The minimalist approach used to put this sandwich together only serves to put each ingredient in a spotlight, while the whole is very pretty to look at and delicious to eat. Lay the bread slices onto a plate. Mix the butter, dill, lemon juice and salt; spread over the bread. Overlap slices of cucumber and egg (adjusting proportions to your taste — more egg or more cucumber, as you see fit). Stir the shrimp and the mayonnaise together with the pepper; place a dollop on top of the sandwich. Tue, Feb 14, 2012 : 2:23 a.m. This made me think of a couple of past experiences. There was a restaurant in Kerrytown for several years (sorry, forgot the name) - it was located where Kosmos is now. They served a variety of soups and other light dishes but included some Swedish open-faced sandwiches. It had a real chef and was a good asset to the Kerrytown group. When we lived in San Diego, there was for a while an actual Swedish smorgasbord restaurant. It was not a &quot;groaning buffet&quot; but an elegantly presented offering of open-faced sandwiches, some salads like cucumber/dill, and a couple of very special desserts. I think some Swedish meatballs may have been implicated too. The key here is a light elegant touch. As the article indicates, it is about quality ingredients where you appreciate each element. It is not an over-the-top &quot;fresshing&quot; (bastardization of a German verb meaning &quot;to feed&quot; as opposed to the &quot;essen&quot; &quot;to eat&quot;) experience. Spare but wonderful. I wish we had more variety of food here. Too many restaurants taste all the same. Tue, Feb 14, 2012 : 5:02 p.m.
Tue, Feb 14, 2012 : 2:33 p.m.
Oh, that smorgasbord sounds so lovely! Beautifully presented food that lets the ingredients shine ... sigh.